Web resources are becoming increasingly personalized  two different users clicking on the same link at the same time can see content customized for each individual user. These changes result in multiple representations of a resource that cannot be canonicalized in Web archives. We identify characteristics of this problem by presenting a potential solution to generalize personalized representations in archives. We also present our proof-of-concept prototype that analyzes WARC (Web ARChive) format files, inserts metadata establishing relationships, and provides archive users the ability to navigate on the additional dimension of environment variables in a modified Wayback Machine. Personalized Web resources offer different representations  to different users based on the user-agent string and other values in the HTTP request headers, GeoIP, and other environmental factors. This means Web crawlers capturing content for archives may receive representations based on the crawl environment which will differ from the representations returned to the interactive users. In summary, what we archive is increasingly different from what we as interactive users experience. Web servers often provide lighter-weight representations to mobile browsers and the larger, full-feature representations to desktop browsers. Content viewed from a mobile browser is often different than content viewed from a traditional desktop browser [9, 28]. This allows mobile devices to more easily and more quickly browse the Web. With the increasing prevalence of mobile browsers on the Web (50% - 68% of sites have mobile representations ), it is becoming important to capture these mobile representations of resources. Mobile pages often contain links to additional resources instead of embedded text and often reduce the number of images embedded in the page . For example, the mobile representation of http://espn.go.com/ contains a section on ESPN Videos, while the desktop representation does not. When http://espn.go.com (the "original resource", identified by URI-R), is accessed, it redirects to http://m.espn.go.com, effectively giving two separate but related URI-R values that go into the archive. Subsequently, the URIs of their archived versions ("mementos", identified by URI-M) are indexed separately and the relationships between URI-Rs and URI-Ms is not presented to the user. To quantify the differences, the desktop representation contains 201 links, while the mobile representation contains only 58 links. These link sets are mutually exclusive, with the mobile representation linking to specific resources (such as box-scores and gamecasts) while the desktop representation links to higher-level resources (such as narratives that include box-scores and may have links to gamecasts). 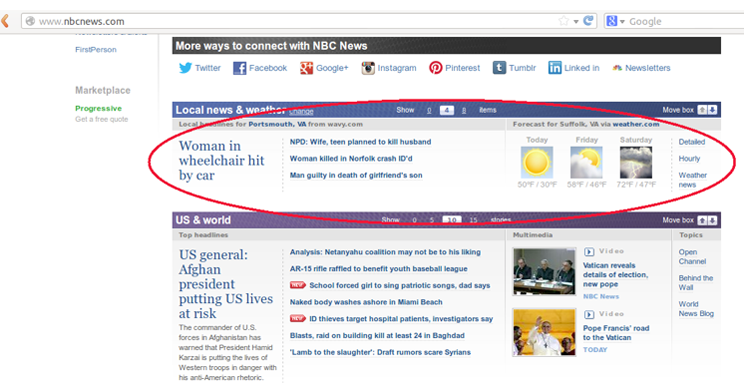 A user may review news articles or other content on a mobile device and be unable to recall the article in an archive. To capture and record the complete set of content at http://espn.go.com, each of these different representations, both mobile and desktop, need to be stored in Web archives. Heritrix , the Internet Archive's crawler, offers archivists the ability to modify the user-agent string to simulate a variety of browsers during archiving. Heritrix can crawl the mobile Web by setting its user-agent string to a mobile browser. This can potentially lead to multiple representations of the same content being captured. If a desktop and mobile representation of the same resource are captured simultaneously, they will potentially collide in an archive. As archiving expands into the mobile and other dynamic domains, archives will contain representations generated with a variety of environmental influences. Therefore, it is no longer sufficient to only navigate archives in the temporal dimension; archives must also provide users the opportunity to understand how a representation was crawled and navigate representations by their environmental influences. The factors influencing the representations seen by a crawler or user need to be recorded and presented to the user viewing the captured representation. In this work, we explore the issue of personalized representations in Web archives, propose a framework to solve this problem, and present a proof-of-concept prototype that integrates personalized representations. We study live resources (identified by URI-Rs) seen by users and proposed methods for mapping archived representations called mementos (identified by URI-Ms) to a canonical representation. This prototype extends the description of mementos from only "when" they were archived (temporal dimension) to "where" and "how" (GeoIP and browser environments). Users can then browse between mementos based on temporal or environmental dimensions. We ran a pair of limited crawls of the cnn.com front page with Heritrix 3.1 and then accessed the mementos captured by Heritrix with a desktop Mac and an Android phone. 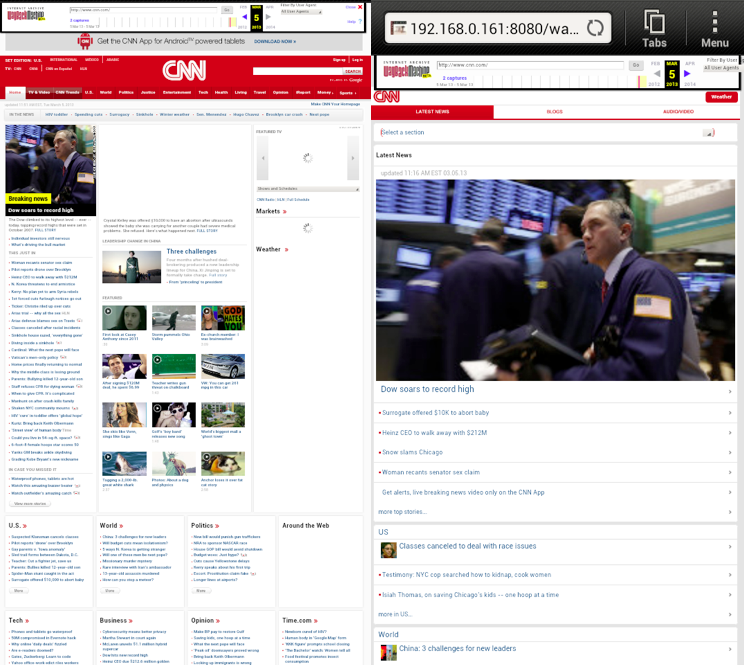 The first crawl captured the cnn.com front page and specified a desktop version of the Mozilla browser as the user-agent in the header string, as seen in Figure 1. The resulting Web ARChive (WARC) file  is viewed in a local installation of the Wayback Machine  and is shown in Figures 3(a) and 3(c). The second crawl captured the cnn.com front page and specified an iPhone version of the Mozilla browser as the user-agent string in the header, as seen in Figure 2. The resulting WARC, as viewed in the Wayback Machine, is shown in Figures 3(b) and 3(d). The mobile and desktop representations differ in archives, but their relationship as permutations of each other is neither recorded nor seen by users; a user of the Wayback Machine may not understand how these representations are generated since they are identified by the same URI-R. We refer to these differing representations of the same URI-R built with differing environments as personalized representations of the resource R.
The headers in Figures 1 and 2 reference the user-agent string with http://yourdomain.com, which is a place holder for the URI for whom the crawl is being executed. For example, a crawl originating from Old Dominion University's Computer Science department would read http://www.cs.odu.edu/.